The spot where the Church of St. Mary Magdalene stands today, as well as on its surrounding land, there were once houses with front yards, as is common among the houses of the village of Gera in the area of Skopelos. Among these was the home of Anthony and Helen Tsantarlioti. On Holy Thursday night sometime between the years 1898-1900, according to Helen Karakonti-Mageira, the miraculous events began in this area. Helen Tsantarlioti was a very faithful and pious woman, who upon returning home from the Holy Thursday night service at St. George Church with her family, as she entered she saw an unknown woman dressed in black like a nun, standing as if waiting for her return. Helen was afraid, since the doors to her house had been locked, so she turned around to leave. The unknown and strange woman said to her: "Do not be afraid Helen. I am Saint Magdalene. I also sit here with you." And she showed her the yard of her house, in which there was a wild olive tree. "I live here exactly", said the Saint, "and I want you from today to light me an oil lamp day and night." She further said: "From now on you will see me frequently, because I chose you to serve me." Helen was left ecstatic. She did her cross and kneeled before her, but the Saint disappeared immediately. As she was moved with tears, Helen's husband with the children were coming behind her from the church. Anthony Tsantarliotis, the husband of Helen, was a poor man, very simple and faithful. Upon hearing of the vision of St. Mary Magdalene, he did his cross numerous times, and with tears he thanked God and St. Mary for choosing his family to reveal His Grace. During this time the island of Mytilene was still occupied by the Turks, and in order for the Turks to not find out anything, despite the relative freedom of the Christians in Skopelos, they decided to not tell anyone. But the next morning, even though it was Good Friday and work was not to be done, the entire family gathered in the yard of the house revealed by St. Mary to clean it thoroughly. They cleaned, they whitewashed, they lit an oil lamp, and they placed rocks around the lamp so people would not see it at night. 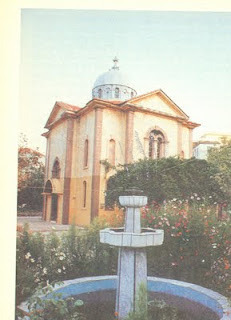 When they were done, Helen went to the Church of St. George and there revealed to Fr. Eustratios Mageiras everything she saw and heard from St. Mary Magdalene. He was moved and advised her: "Think very carefully Helen what you will do. We don't know how the people will receive this. I believe you and bless you for the honor the Saint has given you. But the others? What if the Turks learn of this? They want a reason to harm us." Further up from the home of Helen was the house of Amersoudas Karagiorgainas. Amersoudas would see from her house Helen lighting the oil lamp every night, so she went to Helen and asked her: "What oil lamp is that which you light in your yard?" Helen, unable to completely hide her secret, said: "Well, something is appearing. I can't tell you anything more now." Amersoudas did not push further. She respected her reluctance. She did her cross, turned towards the spot where the lit oil lamp was, and left. Having heard of an old tradition, when she found the opportunity she went near the lit lamp, and without anyone seeing her she grabbed a handful of dirt and put it in a glass. She brought this before her icons in her home where she made a prayer, and kneaded the dirt with the flour she had prepared. She put it aside to rise, and shortly afterwards she was surprised to see that the dough had risen to such an extent that not even the best dough could rise so much. She did this with only a plate of flour, since she was a poor woman, and the tub became full and this made many breads. When she saw this miracle, she went to see Helen, she knelt before the wild olive tree, and with tears in her eyes thanked God and whatever saint, since she did not know who it was yet. She recounted the miracle to Anthony and Helen, and Helen told her the truth. From that moment, hesitantly at first, the people of Skopelos began to hear of the wonders which were occurring. The people would visit the spot and light oil lamps to the Saint. Many took dirt and kneaded it with their flour, and some ill people put it in their water which it cleaned and they were healed. Miracles were reported one after another. In the neighborhood of Helen there lived a woman named Vitsani Koukouli. One morning she went to light her oil lamp to the Saint, and returned home. When she entered, a fragrance like incense hit her. The scent was throughout her home, and she believed it came from her pitcher, which contained water from the nearby well and which she had just drank from. It was as if someone had thrown expensive perfume into the water. The scent permeated her home. Seven years passed. During this time the oil lamp of the Saint was perpetually lit. Next to the home of Anthony and Helen was another home owned by Vitsani Koukouli in which Kantzourda Mageiras lived. 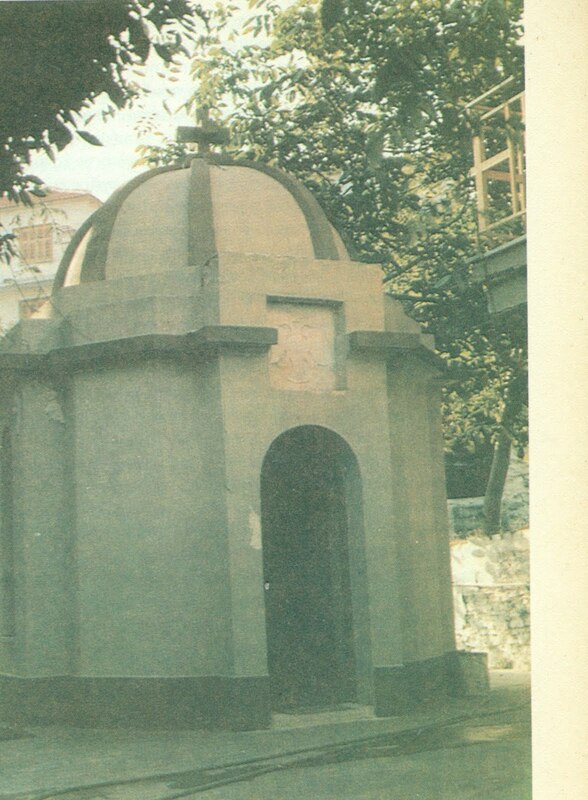 In her yard was an old deep well, about 30 meters deep, and it was from this well that Vitsani had filled her pitcher, which had given off the fragrance. One day a woman lifted the wooden lid that covered the well to protect it from dirt, and as she went to throw the bucket down to fetch some water, she saw the water, which was normally very low, moving. She was surprised to see the water rising rapidly, to the point that it was pouring out of the well. The woman began to cross herself and scream for the neighbors to come, and many gathered and sang soft chants, thanking God and St. Mary Magdalene for another miracle. The bell of St. George Church began to ring and everyone gathered. A wonderful fragrance was coming from the water, like incense, and whenever someone drank from it, it tasted like rose water. Even the Turks gathered and drank of the water, even washing themselves with it. The two priests, Fr. Eustratios Mageiras and Fr. Anthony Papantonis, knelt down and with tears in their eyes began to chant the Supplication Service to the Theotokos. The water continued to ascend and descend, though not all the time. One day the priest was again chanting the Supplication Service, when suddenly he heard a loud noise coming from the well at the time of the Gospel reading. The water continued rising and descending. Upon one of its risings, from the water there emerged an icon and a cross. This happened many times. Every time the priest did a Supplication Service, this cross and icon appeared, but no one could grab them (this was witnessed by my grandmother, who saw this occur many times). After all these things and a thousand troubles and efforts, they finally got the permission of the Turks to build a makeshift church, like a shack, with sticks and boards, because the building of churches were prohibited. 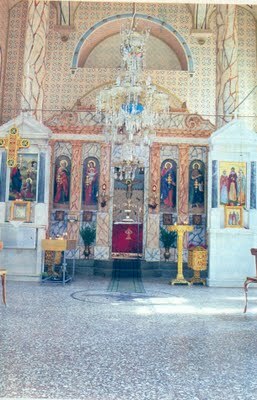 In this church there began to be performed the Divine Liturgy and other Sacraments. 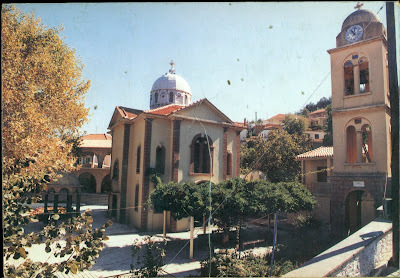 The family of Anthony and Helen Tsantarlioti, despite their poverty, left their home and went to live with Helen's parents, giving their property to the Church. While this was happening the Saint revealed herself to a man of the village, named Haralambos Rallis. 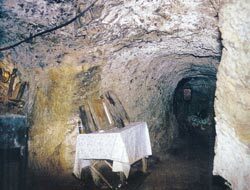 She asked for him to find people faithful and pious, who under his supervision and her guidance, were to dig, beginning from within the makeshift church, to find the catacombs, or as they are known in Skopelos "ΛΑΓΟΥΜΙΑ" (Burrows). And so the digging began. Everyone fasted and dug, without being payed. Quite a while passed and Haralambos ceased the digging. They faced many problems, notably financial ones. The trustees of the Church of St. George, seeing how they dug for a long time and found nothing, decided they no longer wanted to help fund the excavation from the church. The wife of Haralambos Rallis, Regina, even though she believed in Saint Magdalene, since her family had many needs, and seeing her husband had stopped all his own work and dealt only with the excavations, she began to bring objections and obstacles to her husband. 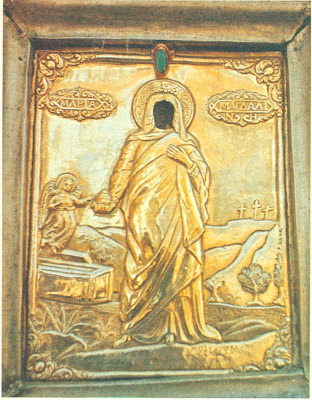 These problems forced Haralambos Rallis to leave Skopelo and go to Polychnitos, where he was from, to work, but above all to escape the indignation of the people who had quickly forgotten the wonders of St. Mary Magdalene and now ironically did not find anything with the excavations. But he did not stay long in Polychnitos. St. Magdalene revealed herself again to him and told him to return again to Skopelo and continue the digging. He complained: "Why, my Saint Magdalene, do you entrust me with this job and not someone else, since you know I suffer by all in Skopelos?" She replied: "I commissioned it to you, because a more pure man in the village I did not find. Go back to Skopelos and I will help you and relieve you." He responded: "Even though the people bring you, my Saint, so much oil to your church, the trustees spend it here and there, and we who dig often times without eating, no one helps." She responded: "Do not worry Haralambos. I will help you. As for those who spend elsewhere the money and the oil of the church, I will pay accordingly. I have many to heal and to bring joy to, but I also have many to punish as an example for their unbelief and impiety." 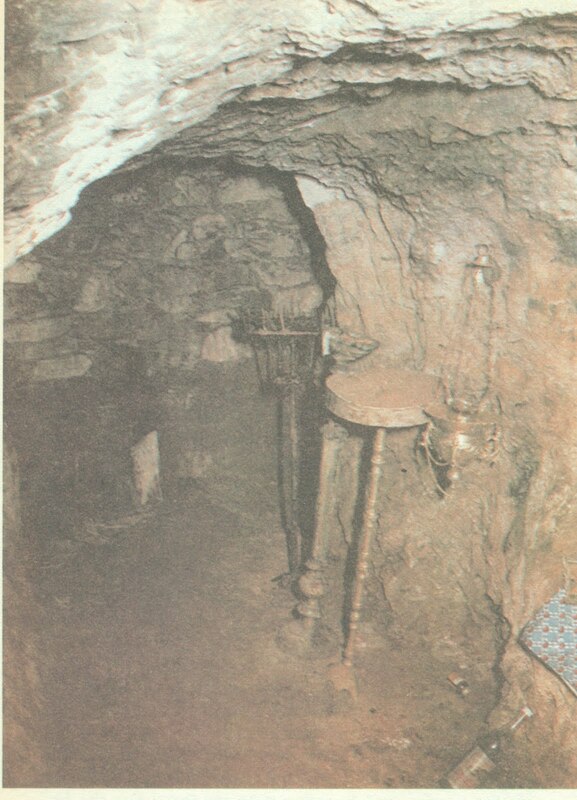 Haralambos Rallis immediately returned to Skopelos, and with the financial help of some faithful Christians, as well as the moral support of his wife and children, who after a miracle of the Saint began to stand by him and give him courage, and despite the derision of the trustees and others in the village, the excavations continued, until one day, in the dirt, an old blackened and almost worn out from the humidity icon emerged. 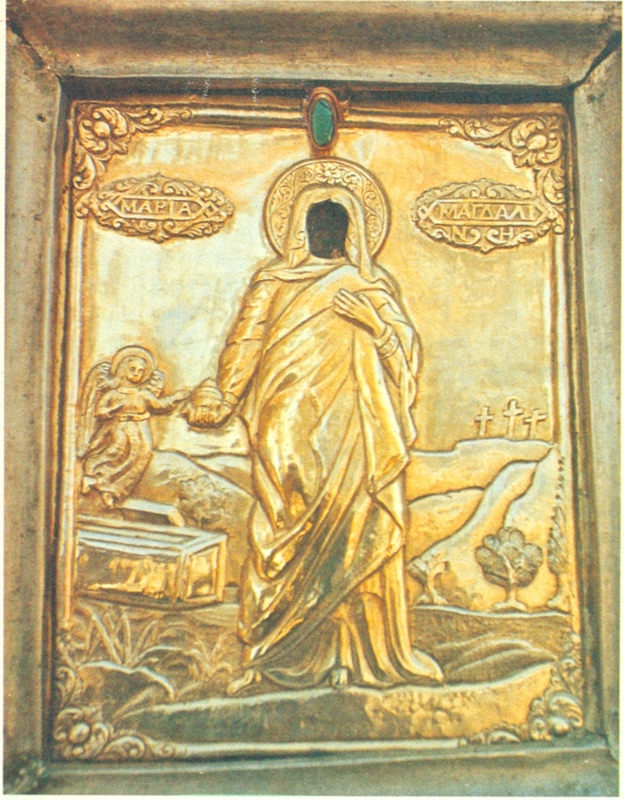 The icon was found around 1910-1911. The bells rang and crowds wept and prayed. For a moment they thought this was the icon they were looking for, but again that night St. Magdalene appeared to Haralambos and said to him: "Haralambos, keep the icon you found in my church for it to be seen and venerated by the Christians, and continue the digging. For you have not yet reached where you should. I will tell you when to stop." With this new command of the Saint, Haralambos and the people continued the digging and reached the point which it is at today. At this point the Saint told him to stop digging: "Enough. Your struggle is over. Here you will all stop." Haralambos told her: "But we did not yet find, my Saint Magdalene, those things you told us." And she replied: "Here where you now reached is enough. I am now an inch from the face of the earth and do not need more than two digs to be revealed. But not now. It is not the appropriate time. For this reason it will still take time for the people to find me. But when I am manifested it will be a Friday and on this day many wonders will occur in this place." Source: Translation by John Sanidopoulos.